To help you prepare better for SBI PO Mains exam, the banking team of jagran josh is providing Banking Awareness questions for SBI PO Mains Exam 2017. General Awareness section plays a vital role in bank examinations as the section helps to score more in less time. 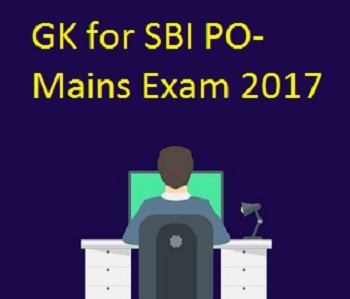 There will be 40 questions in SBI PO Mains Exam 2017. Go through the below quiz and strengthen your preparation. 2. India’s foreign exchange reserves, which are held and managed by the RBU, comprise which if the following? 3. Which of the following statements is/are correct with respect to treasury bills issued in India? a) T-bills offer short-term investment opportunities, generally up to one year. b) At present, the Govt. of India issues three types of treasury bills through auctions, namely, 91-day, 182- day, and 364-day. 4. The term ASBA (Application supported by blocked amount) is associated with which of the following? 5. What is a kiosk? 7. Who among the following is NOT a deputy governor of the RBI at present? 8. The founder of Wikipedia, Jimmy Wales is going to launch a new service. What is the service called? 9. Which country is the world’s fifth largest military spender, as per latest report by the Stockholm International Peace Research Institute (SIPRI)? 10. The Central University for ‘Divyangs’ will be set up in which state?